Roy and Darlene Cochran had come home. The couple, respectively 75 and 74 years old, sat together on the front pew of the old LDS Chapel for the Ogden Valley Branch where both attended services going back to the 1950s. Their memories were drawn to the many times they used sign language to give talks, sing hymns and serve in various leadership positions. 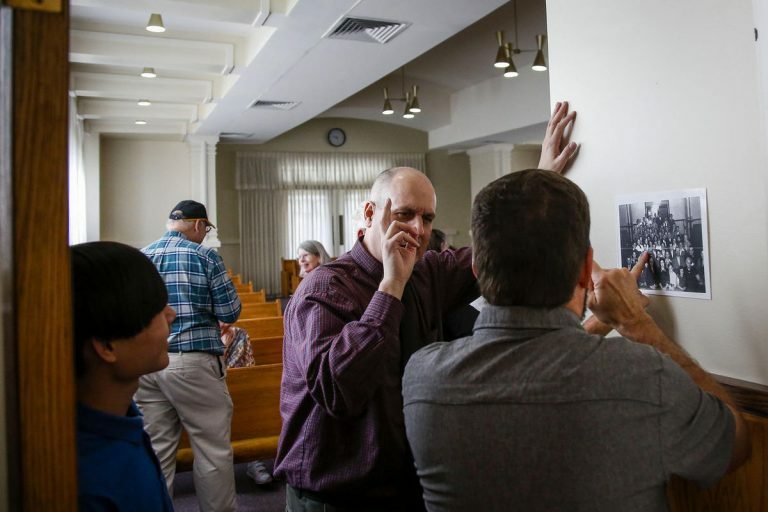 The Cochrans, along with a host of other past and present branch members, returned to the old red-brick church, located at 740 East and 21st Street, Saturday morning to celebrate the 100th anniversary when the Ogden Deaf Branch was created. Surrounded by dozens of friends smiling and greeting each other excitedly with happy hands, the Cochrans savored the nostalgic moment. A group of about 100 people from around the country gathered at the old church to tour the building, reflect on the history and renew old friendships before driving over to the LDS congregation’s current building at 5640 S. 850 East in South Ogden for lunch, birthday cake and more activities. It’s a special reunion, said Mark Erwin, the branch president for the last 14 years.